Note: It occurred to me that the last two holiday episodes of Community have inspired blogs (the third? We’ll see. I wasn’t in school for the last two). Since one of my favorite sitcoms is about to go on hiatus, I figured I’d throw them up here. Here’s the first from December 11, 2009. That was the thought that crossed my mind around midnight as I tried to fall asleep. Like most of my late night ideas, it’s probably an iffy one. But here’s my best take on what was going on in my brain while my head was on the pillow. In President Obama’s Nobel Prize speech yesterday (and I’m way beyond done with the did he or didn’t he deserve it discussion; at the end of the day it’s an award given out by Norwegians), he acknowledged the irony of winning a peace prize days after announcing that he would be sending 30,000 troops. He has to be commended for taking the issue head on and the speech (which can be read in its entirety here) is an interesting monologue on the tenuous nature of war and peace; including the notion of a just war. Last night’s “Community” was on the surface about celebrating this time of year in the context of a diverse society (Sidenote: And they probably went a bit over the top. But it may have been over the top for the sake of showing how political correctness often goes way over the top. Or not. “Community” is kind of like that friend whom you never know for sure whether they’re being sincere or not. But I digress). But it also touched on the topics of standing up for those being picked on, turning the other cheek, and retaliation; the stuff of war but at the micro (and humorous) level. Warning: The following is what is commonly called a spoiler and apparently I have to make that abundantly clear or the Internet Police will take me away and sit me in front of a monitor displaying a never ending slide show of lolcats until I have a mental breakdown and think they’re funny. Dude who would be a stereotypical bully if he were not 40ish threatens Abed (whom is quickly becoming one of my favorite characters on television). Jeff stands up for Abed, an impressively altruistic gesture for someone that is typically unapologetically selfish (but a community of friends is changing him; another post for another time). Jeff trades barbs with Mike the Middle-Aged Bully in a couple of interactions until they set a time to fight. Problem is Jeff has never been in a fight. Troy and Chevy Chase (I know that’s not his character’s name, but I find it even funnier to just think of him as Chevy Chase) tell Jeff that fighting is a manly rite of passage of sorts and, in a typically hilarious scene, try to teach him how to fight. Shirley does not want Jeff to fight seeing as it is Christmas time and it is a time of peace and goodwill (she had earlier given the gang - which consists of a Muslim, Jewish person, atheist, Jehovah’s Witness, and a cult member a bracelet that read “WWBJD” for “What would baby Jesus do?”; over the top, but there was a sincerity to it). Jeff, says he respects Shirley’s beliefs though he doesn’t hold to it, but is going to fight anyway. Now we see Jeff decide that he will turn the other cheek, because he values Shirley’s friendship. Turning the other cheek, however, is not a magic bullet and Mike the Middle-Aged Bully proceeds to pummel Jeff. Seeing her friend beaten in this manner, Shirley gives Jeff the okay to defend himself. It escalates and a melee ensues. All of which leads us to this scene, which, I’m sorry, does contain one profanity. If it helps, when Shirley says, “Jeffrey, kick his …” you can just yell “beep” out real loud. I want to again acknowledge that this is a sitcom and that I’m aware the scene was played for laughs (and it worked). Yet I couldn’t help but notice the symmetry between this episode and what the president talked about yesterday. You could argue that Jeff and his friends engaged in a just war. Jeff was being mercilessly attacked and therefore he and his allies felt the need to retaliate. They won, but was this the best course of action? 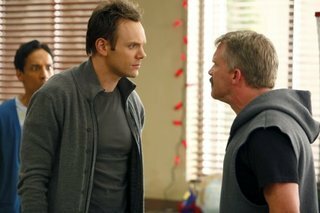 For starters, the conflict won’t necessarily end; especially if “Community” signed Anthony Michael Hall to a multi-episode contract. If that’s the case, there will likely be an recurring feud between Mike and the fly guys and the Community. But regardless of whether we see these guys again or not, that holiday beatdown would likely not be the final word in a real world conflict. The losers would want to get even and on it goes. Obviously things could have been done differently in the lead-up to the fight. Jeff could have defended Abed without insulting Mike. He could have not let his temper get the best of him, which led to issuing the challenge to fight. But when Mike is beating the crap out of Jeff, no one can go back in time to undo things. They can learn from the past and change how they interact in the future. But that doesn’t mean a lot when someone is punching you in the gut. And that’s part of what Obama talked about yesterday. He acknowledged the powerful impact of non-violent resistance, but at the same time we are where we are. The United States was punched in the gut and find themselves in the middle of a far more dire fight. He acknowledged that war was a tragedy for both sides and should only be used when there are no other options. The way of the world with its violence and terrorism puts him as Commander in Chief between a rock and a hard place. From the text of his speech, I believe it is something with which he truly struggles. I understand the struggle (from a philosophical standpoint; I’ve never run a country before). As a Christian, it is hard to know what to do with war and violence. Early proponents of the just war theory were luminaries of Christian thought like Augustine of Hippo and Thomas Aquinas. In scripture, you have violent imagery beside exhortations of peace. With Jesus you have one who tells us to turn the other cheek, but also tells his followers at one point that they will need to carry a sword (and this was before Christians started cutely referring to their Bibles as swords). Despite the instruction that the disciples carry swords, I feel like that is more of a special circumstance and the bulk of his teachings point towards non-violence. Christians are supposed to be of another kingdom, one that does not work by the often violent laws of the world. At the same time, we have to interact with that violent world. I am not naive about this reality. I don’t think the rest of the world could have turned the other cheek to the Nazis and the horrors of the Holocaust and World War II would have been avoided. Yet again, part of how Germany fell into Nazism was the desperate state of their nation; a state created from the fallout from war. I have chased this rabbit quite a long ways and so I’ll wrap this up. I guess the main purpose of this entry was to get myself and hopefully others (if you’ve made it this far) to think. I think it’s safe to say we haven’t mastered the tight rope that runs between war and peace. So we ought to ponder such things. Is a just war theory the best way to encounter these problems? Is phrasing it in terms of “just war” counterproductive? Should we frame our questions as how to make peace as opposed to when it is acceptable to go to war? And am I completely crazy that I drew such a tight connection between a sitcom and an issue that has perplexed humanity throughout its existence? Just a few questions for you.